How Life Insurance Agents are Misselling Insurance policy? Home » Insurance » How Life Insurance Agents are Misselling Insurance policy? A Life insurance agent is one of the respected professions, as they provide life risk coverage to you. However few life insurance agents sell life insurance policy for their personal benefits. They only want commission. They mis-sell insurance policy by making false commitment to you. You will find many incident of mis-selling of insurance policy by agent. Recently one life insurance agent contacted me and asked for the appointment. I have extended courtesy and given him time for half an hour. In the meeting he gave illustration of LIC Jeevan Saral Policy with hand written calculation. Calculation was showing very high return. It was very interesting conversation let’s take a look at excerpt of these conversation. Q – I asked him that expected return shown here is too high do you think is it ok? A- It is LIC of India and you will surely get mentioned return with bonus. Q – Can anyone from LIC give this in writing on letter pad of LIC with authorization? A- Sir it is expected return. I am giving this in writing you need to trust me. Q – Is this standard calculation available on LIC site? A – Sir it is derived calculation by my understanding of policy. Ok, let’s take a look at LIC site. While looking at standard example on LIC site it was completely different. Hand written paper was showing manipulated returns. LIC Agent has no option but to returns back with sorry face. It was clear that life insurance agent wants to mis-sell policy. This is one way there are many other ways adopted by aka life insurance agents. Some examples are given below. This can happen with you also in order to avoid mis-selling for insurance policy here are few tips. You should ask for standard calculation while purchasing Insurance policy. If you have doubt on calculation or return mention, don’t forget to compare it with standard example given on website of insurance company. “Get 1 Crore Cover @ just Rs.450/- per month Buy Now”. “Get 1 Crore Cover for Rs. 15/ Day”. If you get fascinating lucrative offer like above, make sure you go through documents before purchasing insurance plan. Convert days in to month and year to get actual premium amount. In above example effective premium will be 5400 Rs per year. Make sure to clarify all your doubts before purchasing insurance policy. If insurance agent is unable to clarify your doubts it may be possible that you are next target of mis-selling of insurance. You should study product document carefully by yourself. Make sure to go through every terms and condition and benefit details carefully. Carefully look at exit clause and limitation of insurance policy before buying. You should be comfortable with exit clause and limitations. You should not repeat most common mistake of allowing Insurance agent to fill the application form. Insurance agent will fill up the form as per his benefit. He may put of high premium paying terms or additional rider which is not required by you. Check form carefully before signing it. Follow the tips mention above while you are buying Insurance policy from Insurance agent. 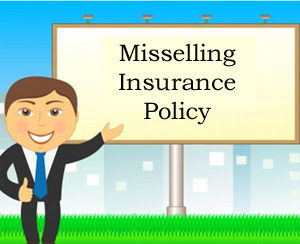 Have you got trapped by mis-selling of insurance policy anytime? If yes do share your experience with all readers. Disclaimer: – Objective of this article is to make reader aware about mis-selling of insurance policy and tricks adopted by insurance agents and insurance company. I am not against any Insurance agent or Insurance company. This post is to keep reader update and aware. Don’t forget to share this post with others! « HDFC Life Click 2 Retire Online ULIP – Should you Invest?